SAS Viya provides import and export functionality for user-created content like reports and data plans. Often, in addition to content, an administrator will want to save configuration so that it can be reloaded or updated and applied to a different system. SAS Viya provides the capability to save and reload configuration using the SAS Viya command-line interfaces that are documented here and that I covered in a previous blog post. The configuration plug-in of the sas-admin command-line interface provides this key functionality. The configuration plug-in allows an administrator to interact with the SAS Viya micro-services configuration from the command line. Before we look at a save and reload, let’s look at the format of the micro-services configuration. The configuration is created at time of deployment and can be supplemented, edited and updated in the SAS Environment Manager Configuration area. configuration definition: a schema that describes a type of configuration. configuration instance: a collection of name-value pairs that a service uses. In Environment Manager there are two “views” where you can add or edit configuration instances. 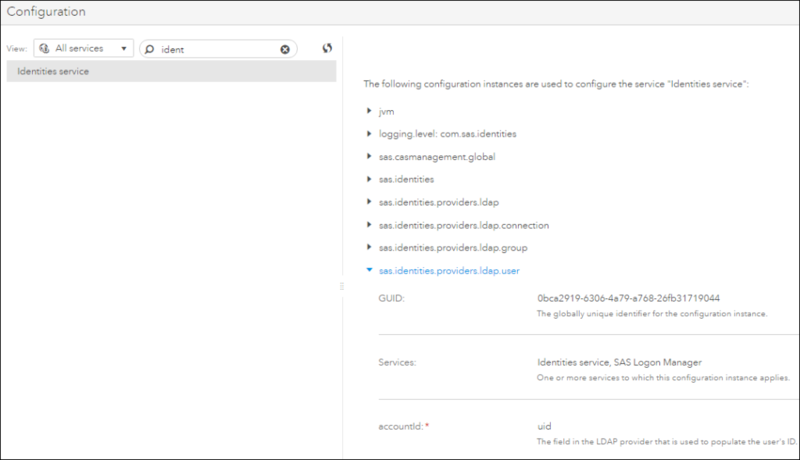 You can select a service to see the configuration instances for that service, or select a definition to see all configuration instances that are defined by the configuration definition. 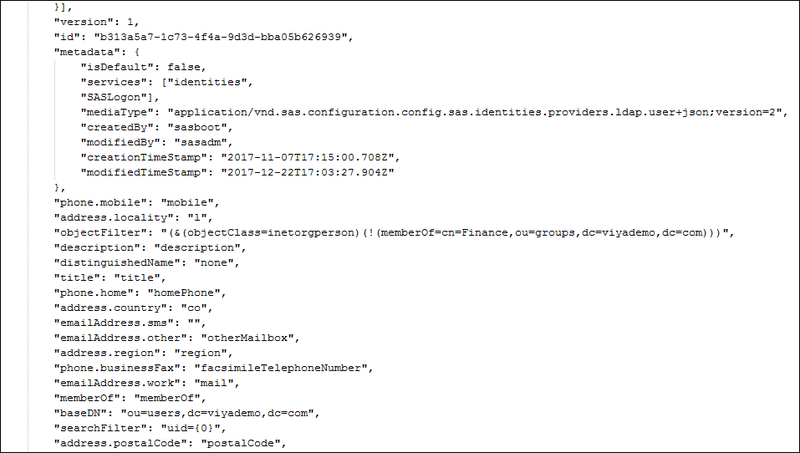 This screenshot shows the configuration instances for the identities service, with (a few of) the name value pairs for the sas.identities.providers.ldap.user visible. As always, when using the command-line interfaces you must create a profile and authenticate. In this example, we use the sas-admin CLI, using sas-configuration-cli plugin and the configurations command to manage configuration objects in the configuration service. The examples use the download command to download the configuration for a service and a definition name. In this case, we get the id of the ldap user SAS Viya configuration. In most cases a server restart is not required after a configuration update, exceptions are documented in the SAS Viya Administration Guide. If you are interested in how configuration storage and update works you can also find details in the administration guide.